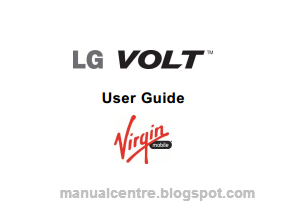 The LG Volt manual also known as the LG LS740 user guide. This manual is available to download in pdf format. It's also available in english language. It has 164 pages (5,44 MB). The Lg Volt user manual contains many reference information such as phone layout, setuyp phone, Install the battery, Lock and Unlock Your Phone, using Touchscreen Navigation, using home screen, Setting Up Guest Mode, Make Phone Calls, Call Settings on page 41, tutorial Import, Export, and Share Contacts on page 51, Google Play Store, using google maps, music player, Turn Wi-Fi On and Connect to a Network, Virtual Private Networks (VPN), using camera and video, recording videos, and Video Camera Settings. Then in this manual also provide detal reference information about using QSlide, Turn Bluetooth On and Off, Pairing Bluetooth Deviceson page 116, using SmartShare on page 118, Insert a microSD Card, Update Your Phone Firmware, Update Your LG Software, phone settings guide like Wi-Fi and bluetooth Settings, NFC Settings, Bluetooth Tethering, VPN settings, Backup & Reset and more.